"Oh, what a beautiful day! I've got a beautiful feeling, everything's going my* way." As I type, I'm sitting on my shady front porch with a cup of coffee, my notebook, and my dogs; we're watching the mail man and listening to the birds scold each other. Sounds rather picturesque, doesn't it?! I know that I'm pretty happy these days and it actually stems from a rather unusual turn of events. In case you didn't know, I was fired from my job as Store Manager, from Greenstreet Cycles last Thursday, the 28th. And it was unexpected (I still haven't heard the cause). And done in an extremely unprofessional manner. And I'm happier because of it. Almost to the week, I'd been working on making that shop a success for the last 3 years. I was approached by an investor who wondered why there wasn't a downtown bike shop in Omaha. I wondered the same thing, and talk turned into business plans, into space selection, into logo scribbling, and shop naming. The whole shebang. I was involved, and basically steering the ship (as the one with a lot of previous bicycle retail experience) since day one. 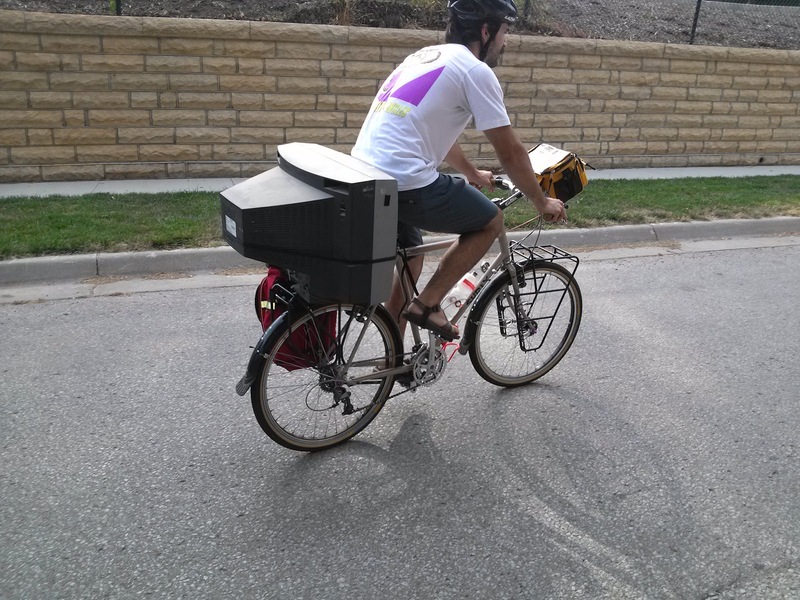 Of course at times it was stressful, but the bottom line was that I was helping people see the importance and power of the simple bicycle. This is the eleventh year that I've been watching people's faces light up when they take that first pedal stroke and I don't know how I can stop now. I truly love pushing this movement that is really starting to take off here in, Omaha, Nebraska. In fact, there's really nothing I'd rather do. It took a while for everyone to get comfortable with the fact that no, I wasn't really going to use my journalism degree to its fullest. But I will say that because of that education, I gained a lot of experience speaking in front of crowds (emcee'ing Greensprints was much easier that way), felt more comfortable in front of a camera (numerous tv, radio, and newspaper interviews), and of course still have fun typing away trying to get my thoughts out of my head and onto some paper (or website I suppose). All of this adds up. Which is why I'm now perfectly prepared to start my own shop. I've also learned over the years that it's hard to trust people. Even when you think that you've done everything you can for some one (either professionally or in any type of relationship) it still doesn't mean that they have to treat you in the same manner. So yes, I plan to start my own shop. Will it be a normal bike shop? Heck no! Will it be totally rad? Well, yes. I'll keep you posted, of course, but in the mean time, the weekly Ladies Rides that I'm so happy to lead will go on! They're now referred to as the Lavender Ladies Ride and you can find the group on good ol' Facebook. I'm also planning on volunteering a lot more at the Community Bike Project and am actually teaching a class there tonight. I'm not sure the current status of their Ladies Nights, but I've asked to help start them back up again. So that's it; that's all I've got to say. Ha. Right. Those of you who know me, know that may not really be all I have to say. But it is for now. I'm off to pedal down to meet a friend for coffee. Oh, the joys of not working 65 hours a week! I know they'll come again, but this time I'll be working for someone I really believe in: myself. a fun one to send you off with! 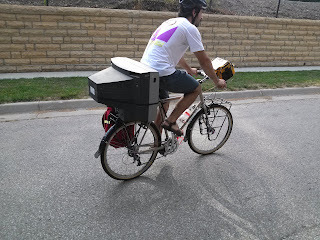 vince with a tv on his bike.